One of the most famous drives in the world is California Route 1 along the Big Sur coastline between Carmel and San Simeon. I've taken the 2.5 hour drive many times but last week I had the choppy Pacific on my right, blue skies above, and seas of wildflowers along the roadside. As you head south from Carmel, you'll pass Point Lobos State Reserve, which is well worth a stop for beautiful ocean views. You might even see an otter floating in one of the coves. Then you'll pass through Carmel Highlands. 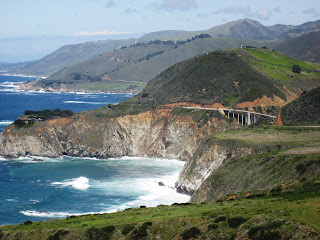 Then it's on to Big Sur. 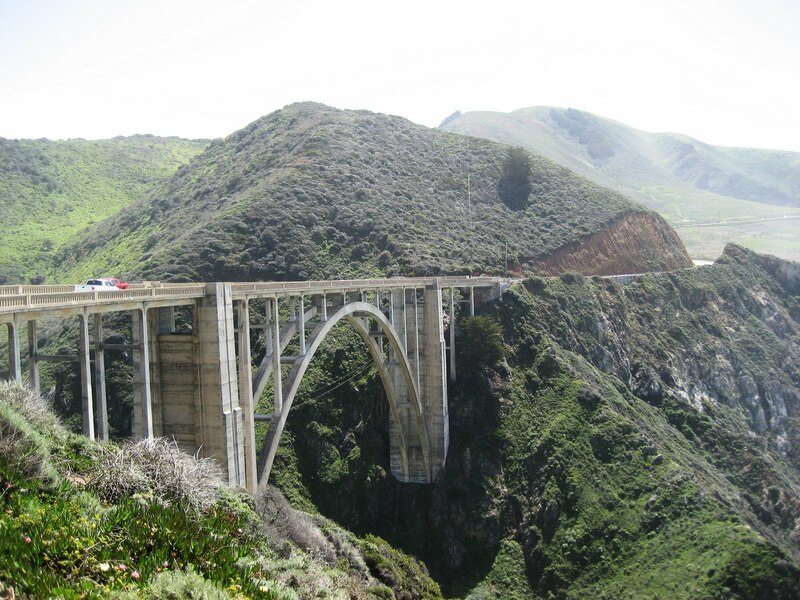 One of the first attractions you'll come to is the Bixby Bridge, one of the largest concrete arch bridges in the world. Stop for photos on the north side of the bridge and again after you climb the hill on the south side. Further south, you'll see a large rock overlooking the ocean. Atop the rock is the Point Sur Lightstation. Most of the time it is closed to the public but docent-led tours are available with an advance reservation. 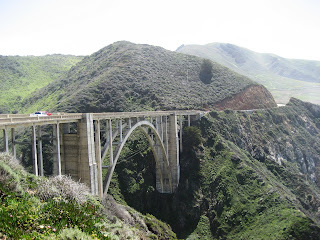 About 45 - 60 minutes south of Carmel, you'll come to the town of Big Sur, home to a variety of restaurants and lodging. The inns with the best views are Ventana Inn and the Post Ranch Inn. Ventana is on the inland side of Route 1 while Post Ranch is on the coast side. Expect to pay dearly if you want to overlook the ocean. Both inns have restaurants where you can stop for lunch. Nepenthe may be the best known restaurant in Big Sur as it is located on a bluff overlooking the Pacific. Again, you pay for the view but lunch here is cheaper than a night at either inn. The Big Sur Bakery is also a good place to stop for lunch or to satisfy your sweet tooth; however, there's no view. Just south of Nepenthe, you'll come to Julia Pfeiffer Burns State Park. Turn left and park in the lot. 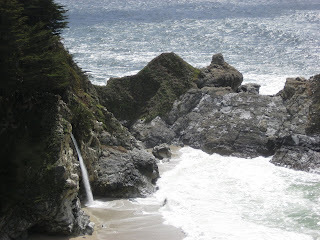 You'll see a trail to McWay Falls. In the spring, the falls plummets into the Pacific. Continue south for many more spectacular views. You'll pass through the very small villages of Lucia and Gorda, both of which have lodging and restaurants. 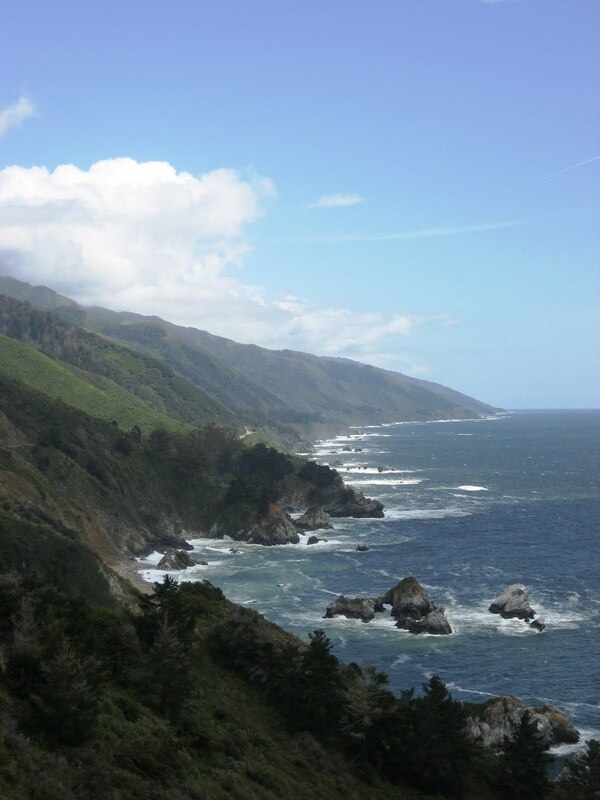 The last place to stay in Big Sur is at Ragged Point. You'll then drop down to San Simeon, where you can visit the Hearst Castle. I'll write about that in my next post.